We’d love your help. Let us know what’s wrong with this preview of People of the Book by Geraldine Brooks. To ask other readers questions about People of the Book, please sign up. Is this book the same work of the woman who penned March? Doesn't seem so. Stilted, unimaginative writing. Very disappointed. What season does this book take place in? heidi what? MANY seasons! it goes back & forth in time… different locations, seasons, cultures, etc. Brooks's novel is a fictionalized account of the real Sarajevo Haggadah, a Jewish religious text noteworthy for its inclusion of an illuminated manuscript and for its survival through turmoil and the hostility towards Jews that has erupted time and again over the centuries in Europe and Eastern Europe. The novel is told from the perspective of Hanna Heath, an expert in book restoration, who is called in to restore the text for display. While working on the book, Hanna finds a few curiosities that she keeps and carefully labels: a butterfly wing, a small sample of some wine stained pages, salt crystals, a white hair, and the notation of some missing decorative clasps. As Hanna investigates each of these items and their origins to gain insight into the Haggadah's past, the reader is presented with the story of each noteworthy item in its own stand alone chapter (stories that Hanna herself can never learn as the evidence she finds only provides her with a basis for conjecture and hypothesis). Each story is unique and not necessarily connected to the others. While the novel has been compared to The Da Vinci Code, it's a far cry from Robert Langdon's action-adventure chase through Europe in pursuit of an explosive secret that might change religion as we know it. Instead, the pacing is slower--the pacing of a scholar motivated by the desire to simply know, even if definitive answers aren't available. And, though the novel explores the nature of Jewish/Muslim/Christian relationships throughout the ages, it doesn't seek to lecture about morality or about what one should (or should not) believe. Despite enjoying it, I will admit that People of the Book has some flaws. The story of Hanna Heath and her strained relationship with her ultra-feminist, professional mother is cliched and not given enough room to become a realistic exploration of a such a complicated relationship. In addition, a few plot points are contrived, but I can forgive that simply because the book appealed to the book lover in me, which is a nice segue way into . . . WHY I HATE THE KINDLE (and all other eReader devices). First off, don't lecture me about how this is the future and I need to embrace it. If you own a Kindle, fine. Enjoy. I'm not suggesting that the privilege be taken away from you. However, I'll not be tempted by the siren song of fashionable technology. I love books. I love the way they feel. I like physically seeing the progress I've made as I turn page after page. I love the cover art. I love how books look on a shelf (in home decorating magazines, I delight in trying to identify the books on the shelves of well-appointed dens and studies). I like to select which books are going on vacation with me, agonizing over which ones might suit my mood. And, when I see someone reading a book, I will often become a creepy Peeping Tom of sorts as I try to catch a glimpse of the book cover so I can see what they're reading. I judge you by what book you're reading--if you're reading Neil Gaiman, I want to know you; conversely, if you're reading Twilight, I may be silently hoping that you get to join the undead (but in a more permanent dead sort of way). So much of that is lost with an eReader. And, after reading People of the Book, I'm aware of how much history can be lost. Not just the tiny fragments that get wedged into the bindings and between the pages, but the history of the people who owned and cherished the book. A world where physical books become obsolete and everyone has an entire library on one portable reading device is also a frightening possibility. How easy then for the next dictator to destroy our beloved texts. Smash one eReader and hundreds, thousands of books are permanently lost--far more efficient than book burnings. It's the impermanence of it all that scares me. Not only that, I think that obsession with books, recognizing and identifying with others because you notice the Christopher Moore font on the book cover or the tell-tell cover art of a Tim O'Brien paperback, helps create a reading community that we're connected to and a part of. How many chance encounters, spontaneous conversations, or just the simple nod of respect to complete strangers with whom we briefly feel connected when we realize we're reading the same author on the same bus--how many of those moments are lost when we're all carrying around the same reading device that indicates no individuality or reading preference to those around us? Will we feel as open to asking a complete stranger, "What are you reading?" Obviously, not all books are as important as the Haggadah, but I like to think that we all cherish our own quaint libraries and someday perhaps they will tell the world about who we were. I expected great things from Brooks - March is a book I treasure - but this novel is a third-rate Da Vinci code, written with about the same amount of skill. The premise is captivating - a 500-year-old haggadah is found in Sarajevo in 1996, and the novel sets out to explore the book's journey across Europe in those intervening years. Along the way, the haggadah acts as an entry point into the tumult, crisis, and unspeakable violence experienced by Jewish communities across E This is an awful book. The premise is captivating - a 500-year-old haggadah is found in Sarajevo in 1996, and the novel sets out to explore the book's journey across Europe in those intervening years. Along the way, the haggadah acts as an entry point into the tumult, crisis, and unspeakable violence experienced by Jewish communities across Europe. Yet the novel does not live up to the premise. The focus is not upon the haggadah or the people who have handled it between 1480 and 1996, but rather upon the Australian conservator called in to restore it in Sarajevo. The details of where the haggadah has been are important because Hanna, the conservator, is writing an essay about its journey, and she'll gain academic and professional prestige from doing so. Hello, cultural appropriation! For example: "why had an illuminator working in Spain, for a Jewish client, in the manner of a European Christian, have used an Iranian paintbrush? Clarissa's identification of this anomaly had been great for my essay. It had given me an excuse to riff on the way knowledge had traveled amazing distances during the Conveivencia, over well-established routes linking the artists and intellectuals of Spain with their counterparts in Baghdad, Cairo, and Isphahan." (321) (We are actually supposed to clap our hands with glee on Hanna's behalf at that point, I think.) Once Hanna's expertise about the haggadah is questioned, she gives up her work as a conservator of old, European and Middle Eastern texts, and instead starts saving Australian Aboriginal art from being destroyed by mining companies. She has an assistant - he's Aboriginal, but it's Hanna who we're supposed to identify and sympathize with, feeling pleased that she's a white superwoman, saving people from themselves. There are other truly problematic issues of race in the text. The first character of color we encounter is a Rasta cab driver who smokes ganja and who won't drop her at Scotland Yard in case he gets caught for using drugs. We meet a man - Raz - who is part African-American and part Hawaiian, and whom the protagonist observes "was one of those vanguard beings of indeterminate ethnicity, the magnificent mutts I hope we are all destined to become given another millennium of intermixing." (141). Yep, that's right, she just called him a mongrel. The depictions of Jewish, Muslim, and Christian faith are so broad-brushed i don't know what to think - it's like a child's paint-by-numbers for major world religions. And of course, in the tradition of Dan Brown, it's a love story. Within a few pages of beginning the book Hanna's sleeping with the Muslim curator of Sarajevo's major museum, and by the end she's overcome her aversion to the idea of a long-term relationship and is ready to be with him. Whoop-dee-doo. A tip from one of my daughter's teachers lead me to the works of Geraldine Brooks, a two time recipient of the Pulitzer Prize for literature. Being the non-fiction connoisseur that I am, I first devoured her memoir Foreign Correspondence. Deciding not to limit myself to only one of her books, I chose People of the Book, her fictionalized history of the Sarajevo Haggadah. Hanna Heath is a Sydney book conservator who has been chosen by the Sarajevo National Museum to rebind the city's famous Hagga A tip from one of my daughter's teachers lead me to the works of Geraldine Brooks, a two time recipient of the Pulitzer Prize for literature. Being the non-fiction connoisseur that I am, I first devoured her memoir Foreign Correspondence. Deciding not to limit myself to only one of her books, I chose People of the Book, her fictionalized history of the Sarajevo Haggadah. Hanna Heath is a Sydney book conservator who has been chosen by the Sarajevo National Museum to rebind the city's famous Haggadah in anticipation of the museum's reopening. Spurred on by her research, Heath's travels take her to Harvard, London, Vienna, and back to Sarajevo later on in order to pinpoint the codex's travels. If the book only centered on Heath's quest in present day, it would still merit a five-star book of intrigue. How fortunate that this is not the case. Brooks intersperses Heath's quest to discover the haggadah's and her own history with chapters on each of the haggadah's stops over the last 500 years. As Heath discovers artifacts while researching, Brooks takes us back in time to World II Sarajevo, Vienna, Florence, and pre-inquisition Spain. The pages are filled with vivid language each describing an epoch of the haggadah's illustrious history. Of course being fiction, Brooks ties up both Hanna's and the haggadah's loose ends with a relative happy ending. I grew more and more mesmerized with the books twists and turns, and the pages read quickly in the book's second half. Where would Heath's quest lead next? Read on and discover the haggadah's path through history. An exceptional novel about a rare book conservator from Australia who researches the Sarajevo Haggadda, an ancient Jewish prayer book. Brooks uses the protagonist's research to tell the story of the book backwards from WWII to 1600s Venice to Moorish Spain. The modern conservators narrative binds the vignettes together. A none too subtle vehicle to highlight the interwoven histories of Christians, Jews and Muslims - the People of the Book - the novel is also an allegory about learning itself and An exceptional novel about a rare book conservator from Australia who researches the Sarajevo Haggadda, an ancient Jewish prayer book. A none too subtle vehicle to highlight the interwoven histories of Christians, Jews and Muslims - the People of the Book - the novel is also an allegory about learning itself and people's struggles to keep the flame of wisdom alight. Original, well researched and provocative, a reader will enjoy the textured characterizations and the personality brimming in each historical sketch. A Hebrew manuscript created in fifteenth-century Spain has been saved from the ruins of a bombed library. Hanna Heath, who specializes in the conservation of medieval documents, is hired to repair and preserve the ancient manuscript. Tiny artifacts found inside the manuscript lead Hanna on a quest to discover how the rare manuscript was created and who risked everything to ensure its safety for five hundred years. The author capitalizes on Hanna's passion for her profession. Her work on the manu A Hebrew manuscript created in fifteenth-century Spain has been saved from the ruins of a bombed library. Hanna Heath, who specializes in the conservation of medieval documents, is hired to repair and preserve the ancient manuscript. Tiny artifacts found inside the manuscript lead Hanna on a quest to discover how the rare manuscript was created and who risked everything to ensure its safety for five hundred years. The author capitalizes on Hanna's passion for her profession. Her work on the manuscript is described with such alluring detail that the reader cannot help but experience the same hushed reverence as she does. When Hanna looks at the manuscript, she sees more than paper and ink. She sees the story behind the book's creation; she senses the hands of every person who made it, held it, cherished it. What others see as blemishes or trash - a red stain, a salt crystal, a white hair lost in the folds of the binding - Hanna sees as clues to the people of the book. Hanna's story alone is strong enough to carry the reader through a captivating journey, but what makes this book so beguiling is the integration of multiple stories from various other characters spanning from 1480 to 2002. All of the varied narratives are masterfully woven together for optimal plot pacing. In a way, the book reads like a collection of short stories, but a common thread - the ancient manuscript - ties everything together into one beautiful tapestry. Blue: intense as a midsummer sky, obtained from grinding precious lapis lazuli carried by camel caravan all the way from the mountains of Afghanistan. White: pure, creamy, opaque. [. . . ] There was yellow made of saffron. That beautiful autumnal flower, Crocus sativus Linnaeous, each with just three tiny precious sigmas, had been a prized luxury then and remained one, still. [He] continued speaking quietly, in short, undramatic sentences. No light. A fractured pipe. Rising water. Shells hitting the walls. It was left for me to fill in the blanks. I'd been in enough museum basements to imagine how it was; how every shell burst that shook the building must have sent a rain of plaster falling over the precious things, and over him, too, into his eyes as he crouched in the dark, hands shaking, striking match after match to see what he was doing. "I have spent many nights, lying awake here in this room, thinking that the [manuscript] came to Sarajevo for a reason. It was here to test us, to see if there were people who could see that what unites us was more than what divided us. That to be a human being matters more than to be a Jew or a Muslim, Catholic or Orthodox." I try to avoid all things popular (e.g., I’ve never seen Star Wars or Titanic) because I know, after all the hype, I can only be disappointed. When it comes to books, though, I feel obligated to read what’s popular so I can participate somewhat intelligently in the conversation. That being said, although I hoped Geraldine Brook’s People of the Book would live up to the buzz, I wasn’t too surprised when it did not. The book is good, but it is not call-up-all-my-friends-(or readers)-and-recommend-i I try to avoid all things popular (e.g., I’ve never seen Star Wars or Titanic) because I know, after all the hype, I can only be disappointed. When it comes to books, though, I feel obligated to read what’s popular so I can participate somewhat intelligently in the conversation. That being said, although I hoped Geraldine Brook’s People of the Book would live up to the buzz, I wasn’t too surprised when it did not. The book is good, but it is not call-up-all-my-friends-(or readers)-and-recommend-it good. People has been compared to The Da Vinci Code, but I find that comparison erroneous. Although better written than Da Vinci (but, come on, a phonebook is better written than Da Vinci), People lacks the plot, mystery, and pizzazz that made Da Vinci a blockbuster. Instead, People is much more reminiscent of Susan Vreeland’s Girl in Hyacinth Blue . Hyacinth follows the provenance of a Vermeer painting. 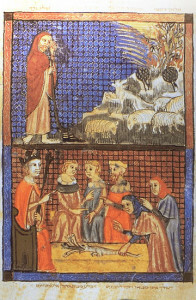 People follows the provenance of the Sarajevo Haggadah. As such, the book is divided into several sections. Five sections follow the Haggadah back in history—to Bosnia, to Austria-Hungary, to Italy, to Spain. As the title suggests, it is not the book that is interesting so much as what happens in the lives of those people attached to it. These sections are the strongest and most interesting in the book. However, for some reason I cannot fathom, some parts are written in first person and some in third. This twist seems to serve little purpose other than to distract and annoy the reader. The book’s greatest weakness is the contemporary storyline that cushions each section. Hanna Heath is a book conservator hired to work on the Haggadah. She finds clues in the book—an insect, a stain, a hair—that reveal its history. Unfortunately, I found Hanna’s story to be downright irritating. Hanna is 30 years old, has a double bachelor’s degree, a master’s degree, and a PhD. She has apprenticed around the globe, is well published and highly regarded in her field. Perhaps I am just jealous, since Hanna and I share the same age and similar academic credentials (okay, hers are much better than mine), but Hanna’s experience and success is simply not plausible for someone so young. Similarly, everyone Hanna meets—from Vienna’s chief archivist to Sarajevo’s head museum librarian—is 30 or under. Really? How did Hanna and her cohorts pack in so much and become so successful in so few years? I could continue my nitpickiness (Ozren, the head librarian, speaks flawless English but stumbles over the word “hoof”? ), but the point is that Hanna is so unbelievable she becomes a rather unsympathetic character. I was far more interested in what happens when she is out of the picture. The story of an extraordinary book and the people who surround it. And I did not enjoy it. My reaction to this one was a huge surprise. I adored Geraldine Brook's Year of Wonders and I thought this would be an easy hit for me. I think the problem is fairly simple- never connected with the main character. I loved Anna from Year of Wonders. I couldn't stand Hanna. The small details of her work that she found so absorbing, I didn't enjoy. I didn't like how she treated people sometimes. I thought she see The story of an extraordinary book and the people who surround it. I didn't like how she treated people sometimes. I thought she seemed rather arrogant. I also didn't like how the timelines bounced around from character to character. I was listening to People of the Book as an audiobook. Without being able to look back and check, I found myself getting confused when I stopped in the middle of a passage and picked it up again after a work day. Brook's writing is just fine. Again, I can't believe I didn't like this. This is grand book. Impressive. Intriguing. Tragic. Beautiful. From beginning to the end. I don't usually like books on war situations but this book received so many good comments and ratings from Goodreads I decided to go for it. I did not regret it. Part of a review (Miami Herald): "Stellar - compelling story. Brooks seamlessly moves from the miniscule - the tiny specks - to examine in human terms the larger events from the thirteenth century and into the twenty-first: the inquisition, the rise of anti-semitism, nazism and the holocaust, religious wars and forces exiles, in Bosnia, Venice, Barcelona and Seville." Big five star. A sensitive story, crossing borders, crossing time lines....Realistic and poetic at the same time. Will be back with more, probably in the weekend. A new favourite! I love it when old stories sound right for their time, and Geraldine Brooksdoes that so well. This novel was inspired by the discovery of the real Sarajevo Haggadah, a book more than 700 years old, so Brooks had a lot of ground to cover and a lot of voices to invent. That describes exactly what I enjoy about what Brooks does--imagines plausible, informative, entertaining scenarios. Who might have penned the text of the haggadah (the Jewish ritual which is read during the Passover Seder meal)? Who might have painted the illustrations? Who is the black woman in a painting, and why is she there? Who managed to save this Jewish treasure from the Spanish Inquisition, the Nazis, and the numerous attempts to eradicate all traces of Jewish culture? This novel is all of those things. We hold our breath as this small book changes hands on its precarious journey through the centuries. Sometimes it’s a Muslim, sometimes a Christian, sometimes a Polish orphan fleeing Nazis in the winter snow. All are in desperately dangerous situations. This has everything--childbirth, torture, intrigue, power, war, greed, compassion--and Hanna’s own story as well. In 1996, Dr Hanna Heath (PhD doctor), an expert Australian conservator of rare books, is invited to Sarajevo to inspect a recently discovered haggadah [Brooks does not capitalise it, incidentally]. It just turned up in the museum, and the unusual illustrations have roused particular interest, as images were generally forbidden in Jewish tradition. Rather than a crumb, she finds a hair and some stains and some missing clasps. Hanna’s methods are as fascinating as the results of her investigation. And there is humour, too. “The art world in England is an absolute magnet for the second sons of threadbare lords, or women named Annabelle Something-hyphen-Something who dress in black leggings and burnt orange cashmeres and smell faintly of wet Labrador. I always find myself lapsing into Paleolithic Strine when I’m around them, using words I’d never dream of using in real life, like ‘cobber’ and ‘bonza’. " Meanwhile, her mother, not only a ‘real’ doctor, but a neurosurgeon (“I don’t just save lives, Hanna. I save the very thing that makes us human” ) is dismissive of Hanna’s cultural conservation expertise. She is a driven, single-minded woman, whose child was a puzzling nuisance. Hanna stands up to mum and uncovers her own history—where she came from and how—and she finds a whole new world of support and respect. But professionally, the rug is pulled out from under her when her expertise about the Sarajevo Haggadah is questioned, so she retreats back home to explore the world’s oldest culture instead. She’s embarrassed to discover how ignorant she (and everyone else) is. Great term, and we need more of it. Desperation Conservation. She tries to put the haggadah story behind her and sets out to catalogue and preserve Aboriginal rock art in situ (diverting dripping water away from it, that sort of thing), working as fast as possible in the tropical heat in Arnhem Land, with little communication and limited time before The Wet turns the dirt tracks to impassable mud. So little is known, so little is protected. When she’s called to the Foreign Affairs office in Canberra from the Arnhem Land cave she’s working in, an official mentions he’s never been to the Top End. What wonderful stories Brooks weaves around the facts. All believable, all fascinating. Oh how I love Geraldine Brooks! This book is I think her masterpiece, so incredibly well researched and detailed. In 1996, Hanna Heath, an Australian rare book expert is offered the job of a lifetime: analysis and conservation of the famed Sarajevo Haggadah, which has been rescued from Serb shelling during the Bosnian war. Priceless and Beautiful, the book is one of the earliest Jewish volumes ever to be illuminated with images. When Hanna, a caustic loner with a passion for her work, discovers a Oh how I love Geraldine Brooks! This book is I think her masterpiece, so incredibly well researched and detailed. In 1996, Hanna Heath, an Australian rare book expert is offered the job of a lifetime: analysis and conservation of the famed Sarajevo Haggadah, which has been rescued from Serb shelling during the Bosnian war. Priceless and Beautiful, the book is one of the earliest Jewish volumes ever to be illuminated with images. When Hanna, a caustic loner with a passion for her work, discovers a series of tiny artifacts in the book's ancient binding--an insect wing fragment, wine stains, salt crystals, a white hair--she begins to unlock the book's mysteries. The reader is ushered into an exquisitely detailed and atmospheric past, tracing the book's journey from it's salvation back to it's creation. In Bosnia during WWII, a Muslim risks his life to protect the book from the Nazis. In the hedonistic salons of fin-de-siecle Vienna, the book becomes a pawn in the struggle against the city's rising anti-Semitism. In inquisition-era Venice, a Catholic priest saves it from burning. In Barcelona in 1492, the scribe who wrote the text sees his family destroyed by the agonies of enforced exile. In Seville in 1480, the reason for the Haggadah's extraordinary illuminations is finally disclosed. Hanna's investigation unexpectedly plunges her into the intrigues of fine art forgers and ultra-nationalist fanatics. Her experiences will test her belief in herself and the man she has come to love. 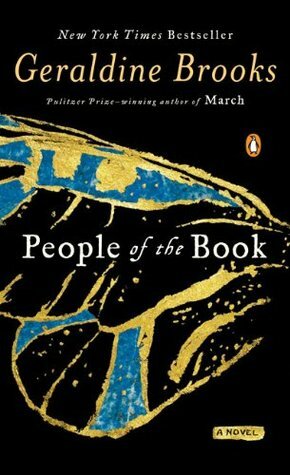 Inspired by a true story, "People of the Book" is at once a novel of sweeping historical grandeur and an intimate emotional intensity, an ambitious, electrifying work by an acclaimed and beloved author. I loved "Year of Wonders" but I now think that this book is Brook's masterpiece. I loved all of it and am glad that I started out writing down all of the names, it helped greatly throughout the novel. This is a sweeping work of historical fiction, with characters starting in Sarajevo in 1996 and then slowly going back 500 years into the past. The story is framed around Hanna, a rare book expert from Australia who is called in to analyze a precious Jewish text that was recovered during the Bosnian war. As Hanna studies the ancient book, she finds clues about its history, such as wine stains, a white hair, and part of an insect's wing. Each chapter takes the reader farther back in time, and we This is a sweeping work of historical fiction, with characters starting in Sarajevo in 1996 and then slowly going back 500 years into the past. The story is framed around Hanna, a rare book expert from Australia who is called in to analyze a precious Jewish text that was recovered during the Bosnian war. As Hanna studies the ancient book, she finds clues about its history, such as wine stains, a white hair, and part of an insect's wing. Each chapter takes the reader farther back in time, and we see how many miracles it took to preserve the book for so long. Being a librarian and a general lover of books, I was intrigued by this novel and expected to love it. It is a good story, but my enjoyment was dampened by the melodramatic dialogue — especially the overwrought relationship of Hanna with her mother — and some of the historical scenes were a bit too precious for my taste. It is an interesting story and it's obvious that Geraldine Brooks did a tremendous amount of research to write it. I admire the work that went into creating this novel, and do plan to read more of Geraldine's work. This is a wonderful story of a magical book, an illuminated manuscript begun in the 15th century and found in Sarajevo after the Bosnian War, a Jewish manuscript rescued by a Muslim librarian who could not bear to see such a treasure be destroyed. Based on some fact and the author's talented recreation, we see the history of this religious piece over the years as some seek to destroy it and others work to save or embellish it. We move backward in time from the modern time to the Nazi era, to 19th This is a wonderful story of a magical book, an illuminated manuscript begun in the 15th century and found in Sarajevo after the Bosnian War, a Jewish manuscript rescued by a Muslim librarian who could not bear to see such a treasure be destroyed. This is a marvelous book. I really enjoyed this author’s Year of Wonders and I think I liked this book at least as much. This is skillful and enthralling storytelling that’s also thought provoking. This book is one of the most skillful renderings of a book that goes back and forth in time that I’ve ever read. Ditto for the writing of a historical fiction account, especially one that has part of its history in the very recent past. This is a historical fiction story about the Sarajevo Haggadah. (A This is a marvelous book. I really enjoyed this author’s Year of Wonders and I think I liked this book at least as much. This is skillful and enthralling storytelling that’s also thought provoking. The story goes from present to past, back to present, to farther and farther in the past several times, each time returning to present day, and ending back again in the present. I was afraid this storytelling technique wouldn’t appeal to me or that I’d have a difficult time remembering everything and everyone, but the author manages to tell each story flawlessly and she’s able to perfectly connect all the stories. I cared about so many of the characters in each historical period and place. I enjoyed every single sub-story, and I became emotionally involved with each one. Right away, as soon as I opened the book, I was happy because there’s a map. A map is on the inside front and back covers. Oh, how I love maps in books! This one is wonderful because it follows the route the Hagggadah in the story took: from Seville in 1480 to Sarajevo in the twentieth century. There are a few drawings on the map of how things would have looked in these places/times too. I particularly enjoyed the story of present day Hanna’s relationship with her mother, but I hate to single out that one because there were so many wonderful characters and relationships. I was extremely touched by one of the main characters from the 1480 portion of the story. On page 320 of the book this quote: “The point – that diverse cultures influence and enrich one another…” sums up a lot of what happens during the course of the 500 years of the story. While this influence was shown not always to be from benign relationships, I found it particularly interesting and heartwarming that positive relationships between Jews and Muslims were shown throughout these 500 years. If there are any villains at all, it is the Christian inquisitors and rulers during the late 1400s to the early 1600s, but Christian, Muslim, and Jewish characters from all periods are shown as admirable, and often as having friendly and mutually beneficial relationships with one another. Both laudable and monstrous human characteristics are shown. There are people who risk their lives to save people and books; there is torture, slavery, and other atrocities as well. As someone who loves books, and who appreciates old books, I found this fictional history of a book fascinating. I was also absorbed both by the inside look at the craft of book conservation work and by the detective work that can be involved as part of it. On a personal note: I’ve been an Olympics junkie since my teens and clearly remember the Sarajevo Olympics, including the interviews at the time about how everyone in the area was getting along so well together, and then what happened there in the years following, so those parts of the story seemed very familiar to me. Historical fiction stories often torment me because I always want to know what’s real and what is fiction. As I was finishing up reading this, I planned to research what was history and what was fictional in this tale. What I very much appreciated about this book is that the author gives the reader all this information in the afterword; she does so in a very few pages but does so comprehensively. An added note: My book club meeting to discuss this book isn't for over a month, but I'm not concerned about it remembering enough; this is a memorable book. Multiple timeline historical fiction based upon the Sarajevo Haggadah, an elaborately illustrated ancient Judaic text that had been saved in the past by two Muslims and a Catholic priest. It is unusual in featuring artwork, which was not common in Jewish texts of the time period. The modern story follows Australian book conservator Hanna Heath who, in 1996, is called upon to evaluate and restore the book. During the evaluation, she finds small pieces of evidence of the book’s 500-year history. S Multiple timeline historical fiction based upon the Sarajevo Haggadah, an elaborately illustrated ancient Judaic text that had been saved in the past by two Muslims and a Catholic priest. It is unusual in featuring artwork, which was not common in Jewish texts of the time period. The modern story follows Australian book conservator Hanna Heath who, in 1996, is called upon to evaluate and restore the book. During the evaluation, she finds small pieces of evidence of the book’s 500-year history. She travels the world to consult with experts to discover its secrets. The modern story is interspersed with chapters showing how the book passed through the hands of people who created it, used it in Passover rituals, safeguarded it, and rescued it from destruction. Hands are mentioned numerous times and are clearly symbolic of their various attributes such as skill, purpose, blessing, expression, protection, justice, and humanitarianism. Brooks has obviously done extensive historical research, as the book includes episodes (and the associated brutality) of Spain in the 1400’s, the Spanish Inquisition, 19th century Vienna, World War II, and the Bosnian War. Sections of this book will appeal to bibliophiles, especially the detailed information about book-binding, preservation, old parchments, and the like. The past stories are filled with colorful well-drawn characters and vivid settings. Each historic vignette introduces new people and the reader should be prepared for multiple shifts in timeline and perspective. The book’s diverse backstories were more appealing to me than Hanna’s personal account, which at times ventured close to melodrama in the form of a rather unconvincing romance and a quarrelsome relationship with her insensitive mother. In the Afterword, the author clarifies what parts of this book are based on fact and what she has invented. The Sarajevo Haggadah is a real text dating back to medieval Spain and was saved by a Muslim museum curator during the Bosnian War. Unfortunately, not enough of its history is known to write a non-fiction account. Instead, the known history forms a framework for the author’s imagination. Overall, I think the author succeeds in exploring the emotional lives of her characters, showing human responses to traumatic events, and promoting tolerance among diverse faiths and ethnicities. If you appreciate books about books or the history of medieval artifacts, you will likely enjoy this book. From 2011-2013 I belonged to a phenomenal book club at a library in Belvidere Illinois. The Director of the Library led the group and picked the books. I have never been happy in any book club I've tried since then. I loved every book she picked and People of the Book was one of them. It's the story of a Hanna who is a book expert who is called in to analyze and conserve a very rare book of Jewish history called the Sarajevo Haggadah. People of the Book is based on a true story. This book is bea From 2011-2013 I belonged to a phenomenal book club at a library in Belvidere Illinois. The Director of the Library led the group and picked the books. I have never been happy in any book club I've tried since then. I loved every book she picked and People of the Book was one of them. It's the story of a Hanna who is a book expert who is called in to analyze and conserve a very rare book of Jewish history called the Sarajevo Haggadah. People of the Book is based on a true story. This book is beautifully illustrated and has been saved from destruction, often by Muslims, throughout its history. I got caught up in the story told by the book and in Hanna's life and the discoveries she makes during her painstaking research. The Haggadah has a life of its own and it's hard for me to describe how breathtaking The People of the Book is. I adored this novel! It contained all the elements of my favorite contemporary fiction: impeccable historical research, geographic locales that are as strong as the characters, characters who are multi-dimensional & believable, a plot that weaves multiple threads and themes in good pace and with precision. With this, Brooks moves into my favorite authors column. The protagonist is a rancid harpy about whom I don’t care a damn, and the mother’s more loathsome than the spawn! Brooks accomplishes nothing by opting for repugnant main characters. Moreover, the entire modern-day plot is offensively implausible (not to mention, totally derivative of ANGELS & DEMONS and THE DA VINCI CODE). As to the historical fiction, I appreciate what Brooks is trying to do. Some of what she comes up with is interesting enough. I actually quite dig the s SO DISAPPOINTING!!! As to the historical fiction, I appreciate what Brooks is trying to do. Some of what she comes up with is interesting enough. I actually quite dig the section set in Vienna during La Belle Époque. But the section set in Seville during La Convivencia is virtually unreadable. That entire swath of the novel is written with such apparently deliberate vagueness that I’m left unable to picture what’s being described. At all. If the reader can’t conjure any mental image from the text, the novelist has failed. And the more vivid the mind movies fostered, the better the book. That said, I vehemently recommend the article that inspired the novel, which Brooks published in the December 2007 issue of The New Yorker. Truly among the most moving works of feature writing I’ve yet read. Brooks is, by trade, a reporter (and a good one). But she is not (as yet) a novelist. Perhaps she should stick to journalism and leave fiction to those more adept with character and evocative language. Geraldine Brooks has a way of weaving through historical moments of cogent settings, to make powerful, real-life stories vivid through narrative. Most times I find her narrative peculiar and alluring, like the close narration in March, for example. In Year of Wonders: A Novel of the Plague, she had me immersed in style and dialect and of the three novels of hers I've read so far, she managed to keep me invested in the setting and "situation"(i.e. war). Bosnia was a focus in this book, and it ope Geraldine Brooks has a way of weaving through historical moments of cogent settings, to make powerful, real-life stories vivid through narrative. Most times I find her narrative peculiar and alluring, like the close narration in March, for example. In Year of Wonders: A Novel of the Plague, she had me immersed in style and dialect and of the three novels of hers I've read so far, she managed to keep me invested in the setting and "situation"(i.e. war). Bosnia was a focus in this book, and it opened with Hanna Heath, the woman chosen to work on "one of the rarest and most mysterious volumes in the world: The Sarajevo Haggadah, an illuminated Hebrew manuscript." Hanna's flat narration works, once you realize her backstory: she is a woman who misses a mother's love, so she seeks it in her work, "sometimes I feel like a figure in one of the Persian miniatures I conserve, a tiny person forever watched by immobile faces, staring down from high galleries or spying from behind lattice screens. But in my case, the faces are always just that one face, my mother's, with her pursed mouth an disapproving glare." This is the very first book about books I've ever read that left me hating people more than when I started it. Hanna, what a terrible waste of a person. Sarah, her mother, my GOD what a cold, stoney bas-relief of a human being she was. Orzen, Werner, yechptui on all of 'em and the parts set in the past...! The Nazis, well, it's shootin' tuna in a 55-gallon oil drum (aka the Gulf of Mexico) to hate THEM, but the collaborators! On and on, back through the Western World's horrible, cruel, hagridden-by-God history...! The Sarajevo Haggadah is to be pitied that it was created by human hands. Books can bear evil (The Turner Diaries) but few become the focus of such concentrated evil as Brooks paints this poor thing. I think an alternative title for this book could have been something like Women and Love or What Women Mean When They Talk About Love. Something like that. It was so beautiful in this delicate, fine-art way, and I was so surprised at this book’s beauty, that I feel totally inadequate in trying to describe my reaction to it. It is that type of beauty I feel when I think about the improbability of our bodies being alive or of Michelangelo’s ceiling in the Sistine Chapel or of microscopic images of I think an alternative title for this book could have been something like Women and Love or What Women Mean When They Talk About Love. Something like that. It was so beautiful in this delicate, fine-art way, and I was so surprised at this book’s beauty, that I feel totally inadequate in trying to describe my reaction to it. It is that type of beauty I feel when I think about the improbability of our bodies being alive or of Michelangelo’s ceiling in the Sistine Chapel or of microscopic images of snowflakes. There is no way the universe could conspire so delicately for those things to work in such a way that their beauty is not so improbable as to be obscenely contrived, but somehow it does work. It is beautiful. And now that I’ve compared this book to the Sistine Chapel, there is no way anyone could go into it liking it. It’s like that time this douchey guy told me that Bright Eyes is the new Bob Dylan. I mean, Bright Eyes is not great anyway – talk about being in love with your own mysterious allure – but, compared to Bob Dylan, Mr. Eyes is just embarrassing. So, here I am ruining this book for you like that. At the same time, after reading this, I understood a lot more why someone would write a book like Olive Kitteridge, using multiple, somewhat unrelated, perspectives strung together by a common theme. While that one just seemed ridiculous, this one soared for me, and I can see how, as an author, you could want to aim for this kind of delicacy in weaving together stories. I listened to this on audio, and it was like hearing someone describe every way a woman’s love can be beautiful and painful, harsh and delicate. Some books will make me cry, but this book brought me to tears, which is the same thing but more elegant because of this story’s elegance. The reader’s voice was lovely, and the only fault with listening to this on audio was that there was so much I wanted to hear and follow that I know I missed a lot. I usually choose audio books based on the idea that it won’t matter if I space out during the book (because I space out a lot while I’m walking to work and listening to them), so I normally choose a book that I’ve read before or something I don’t think I’ll love that much. I was surprised at how much I loved this one and how much I felt I missed by listening to the audio. It is not a difficult book, but it definitely contains subtlety and passages that I would probably have read over again if I were reading it on the page. This is not a very exciting review, I think, because it doesn’t contain an exciting story. I have the most wonderful job in the world right now, at which the most amazing things happen, but I can’t talk about it on the internet. And, no, my job is not Fight Club. If I could, I would tell you about how this has probably been the best year of my life so far, and about all of its beauty and fullness, and about how pain is as much a part of the beauty as comfort or wonder are. And I would tell you about the women I have seen and the ways they are with the love in their lives. But, instead, I will just be vague, and say that this book resonated with me both in the year I have had and in the life I have had. It talked about the right things and in the right way. What is it that makes a book compelling? This one, apparently, has all the necessary ingredients to make a novel difficult to forget. I'd say it's historically well researched, it has masterly developed and believable characters and an interesting thread which holds all of them together. "People of the book" is exactly that, the story of the different people who, through centuries and centuries, managed to create or to keep or to protect one of the most treasured books ever, an ancient Haggadah. Th What is it that makes a book compelling? Each chapter, starting from recent times and going backwards, gives the reader a real glimpse of what the lives of the people who had the book might have been like: Jews in modern Sarajevo, Inquisition in hypocritical Venice, Muslim and Christians in Spain... There's a great deal of history in this novel, and, in my humble opinion, a well researched one. So, why only the two stars then? I really don't know. It's not that I didn't like the story: an old precious book, and independent and smart heroine, the well thread characters... It seemed the book had it all. I was actually quite hooked at the beginning, but when I kept reading, I started to feel disconnected from the different characters which appear along the novel. In a way, it seemed like a collection of short stories (which I generally don't enjoy much), and even though you learnt something about each one, it felt as if their stories were left unfinished, and some of them became even uninteresting. And then, I ended up sort-of-not empathising with Hannah, especially regarding the story with her mother, it seemed a bit cheapened in the end. Not to talk about that supposed relationship with Ozren, completely unreal and fake. It was here to test us, to see if there were people who could see that what united us was more than what divided us. That to be a human being matters more than to be a Jew or a Muslim, Catholic or Orthodox. 3.5 stars. I absolutely loved the historical fiction stories. It worked really well telling them in reverse chronological order, as it feels like you are slowly unfolding the suprises of the Sarajevo Haggadah. The people in these stories and the stories themselves were so diverse and interesting I could not wait to get to the next one. As always truth is stranger than fiction, and I loved finding out that this novel and some of the events was based on the true story of an ancient Jewish codex saved from the fire by a Muslim librarian. Unfortunately I did not enjoy the "now" story that binds all of these together. I never connected with Hanna or anyone else, especially her mom, who was the most one-dimensional character I've read in a long time. Even with this critique I highly recommend this book if you are interested in HF and religion. The Sarajevo Haggadah, an illuminated Hebrew manuscript, was saved during the Bosnian conflict by a Muslim librarian at the National Museum and placed in a bank vault. Hanna Heath, an Australian rare book specialist, is given the opportunity to inspect and conserve this beautiful book which dates back to 15th Century Spain. As she inspects it, she finds evidence that suggests the history of the Haggadah as it changes hands traveling from Spain to Sarajevo. "People of the Book" moves forward in ti The Sarajevo Haggadah, an illuminated Hebrew manuscript, was saved during the Bosnian conflict by a Muslim librarian at the National Museum and placed in a bank vault. Hanna Heath, an Australian rare book specialist, is given the opportunity to inspect and conserve this beautiful book which dates back to 15th Century Spain. As she inspects it, she finds evidence that suggests the history of the Haggadah as it changes hands traveling from Spain to Sarajevo. "People of the Book" moves forward in time with Hanna's life--her career, a love interest, her mother--which is the less interesting half of the book. In alternating chapters written almost like short stories, it moves back in time to Bosnia in World War II, to 19th Century Vienna, to Venice during the Inquisiton, and to Spain in the 15th Century. Sometimes, I wished I knew more about what eventually happened to the characters in the historical stories. The manuscript changed hands at times of intolerance among the Christians, Jews, and Muslims.